Here is a commission of one of my favorite characters. Chibi-Jack Sparrow was painted with watercolors on bristol board. Approx. 6"x 8". 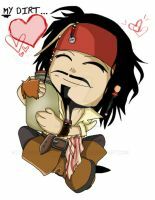 Jack Sparrow is TM & (c) 2007 Disney. It's definitely on my list. And I did one should be in the gallery. excellent Jack ! very nice style! That's so cute, and I love the way you coloured it! Thanks. I think it's the little details that count. wow he got black nails?! He's so cute! I just browse through your entire gallery, and I love your Chibis! Wow! Thanks. I really appreciate that. I put a lot of care into these little fellows. I drew one too.. check it out... but its just pencils. You are realy great with water colors! Im adding this one to faves! Checked out yours. Cool! I gottajarofdiirt and guesswhatsinsideit! I saw this pic as your avatar and I went through your whole gallery looking for it. I'm glad it was on the last page, I had a blast looking at your art. Wow. Thanks. That's very kind indeed. Thanks! I like to reference stuff as much as possible. Thanks, Google. Thanks! I really just started posting recently. I love your style it's fabulous! I've had a long look at your gallery, and I have to say that you wield chibis like lethal weapons. Bravo! Where the rum is never gone.